There are so many Online Affiliate Networks out there, which network is the one used by most affiliates, and which is the most popular? Webmasters and Bloggers who looking for top, best Affiliate Networks are always asking these questions. Fortunately, we get the answer from the 2012 AffStat Report. The 2012 Affiliate Summit was held in August this year, over 1,400 affiliates who attended the meeting were surveyed on their methods, preferences, and strategies by AffStat, which has come out as the AffStat Report. 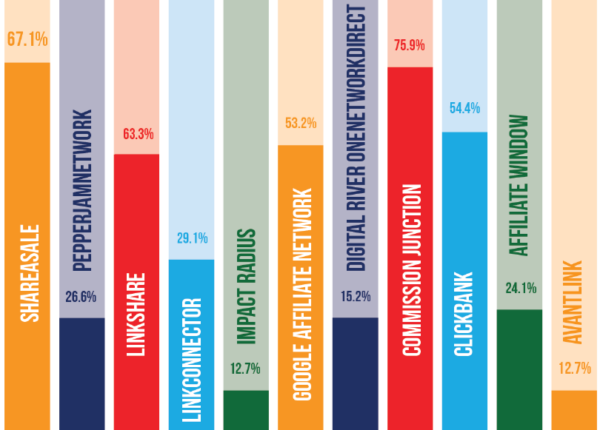 The 2012 Affiliate Summit AffStat Report features dozens of charts of data, based on the responses from the participating affiliates on affiliate marketing, social media, search marketing, blogs, email, and demographics of affiliates. From the report we can see, among the top 10 most-affiliate-favorite networks, CJ is at the top, favorited by 75.9% affiliates; ShareAsale 2nd, favorited by 67.1%; LinkShare 3rd, favorited by 63.3%; followed by Clickbank (54.4%) and Google Affiliate Network (53.2%). Commission Junction (CJ) is one of the largest affiliate network in the market that operates globally. It provides pay-per-action (PPA) affiliate programs and Pay Per Call program. 63% large merchants and well-known brands on the Internet Retailer Top 500 List choose Commission Junction as their third-party affiliate programs. Be a CJ affiliate you can instant access widely recognized and highly specialized brands, transparent performance metrics, customized transactional feeds and great supports. CJ reviews and approves affiliate application manually. If you have a website or blog with your own domain name, you should have no problem to get into CJ's affiliate network. ShareAsale is one of the largest pay-per-action (PPA) affiliate network that pays commissions to its affiliates for driving conversions (per sale or per lead). ShareASale has over 3,000 merchant programs, provide many affiliate choices for websites and blogs about SEO, webmaster tools, Wordpress themes, business, and marketing related topics. LinkShare is another large pay-per-action (PPA) affiliate network which provides more than 3,000 affiliate programs, and has probably the most affiliates in the world- which is said about over 10 million affiliate partnerships- and provides quality and international capabilities. Clickbank has a long history and remained popular in the PPA affiliate market. It focus on digital products including e-books, software, and membership sites, and has become one of the biggest online marketplace for e-products. Clickbank offers highest commissions (up to 75%) on its tens of thousands of digital products, paid weekly. Clickbank almost accepts anybody to become affiliate. Google Affiliate Network is not so familiar-ed by many people. It provides many categories for affiliates to choose from, except blogging, make money, etc. It provides link generator, data feeds, banners, report and tracking tools. The advantage for Google Affiliate Network is that it integrates with Google AdSense, affiliates earnings are combined with AdSense, so to make reaching Adsense $100 threshold faster. What's your experience of the affiliate network? Which network do you like the best? Share your experience and insights in the comments box below.